Rove Beetles are very efficient flyers. They have short wing covers, slender bodies with straight sides. They fold their wings into the small covers using their abdomens, so they often run with their abdomens upturned. The Rove Beetles are one of the most successful beetle families, with over 30 000 species and 1 500 genera, but only 750 species are known from southern Africa. The Protea Rove Beetle is relatively unknown - it does not even have a species name. They visit most proteas, but prefer the Bearded Sugarbushes. They occur in high numbers in young flowerheads (on average between 10-20 per flowerhead, but up to often several hundred). They feed on pollen and nectar. They fly between flowerheads in large numbers on hot "Berg Wind" days. They are very small, but presumably do pollinate proteas as they do carry pollen. Their larvae probably live in the Sugarbush flowerheads as well. Hister Beetles are black, shiny beetles with antennae with an elbow and club-shaped tip. They tend to be flat and feed on larvae of other insects. Protea Hister Beetles apparently eat other insects in the Sugarbush flowerheads. There is usually only one beetle in each flowerhead, and they remain in the flowerhead for the life of the flowerhead (about 2-3 weeks). 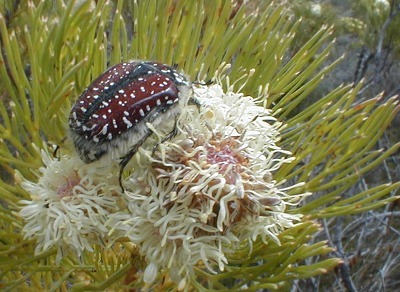 The Protea Monkey Beetle is found in very low numbers in flowerheads, except in older flowerheads (about 10-20 days old), where they average 1-2 per flowerhead. But this is misleading, because most flowerheads contain no beetles. A few flowerheads contain orgies of 10-100 beetles. 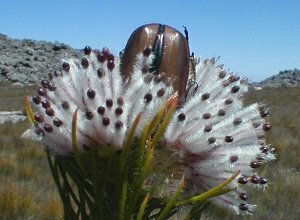 Why Protea Monkey Beetles congregate like this is unknown. The males fight for prime positions in the flowerhead using their large hind legs as rakes to push away intruders. Both males and females occur in equal numbers in the flowerheads. They feed on pollen and nectar. The Scarab Beetle Family includes Dung Beetles, Rhinoceros Beetles and Rose Chafers. The family is identified by its antennae with fan-shaped lobes which can be folded closed and its C-shaped larvae. 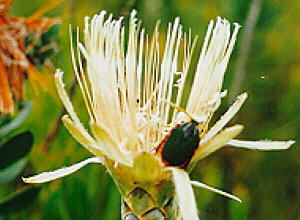 The Green Protea Beetle is found on most Sugarbushes, but prefers the Bearded and Spoon-bract Sugarbushes. These beetles are large and powerful enough to force their way into the flowerheads and thus pollinate the flowers. They are one of the few beetle types which to not have to worry about being eaten by Sugarbirds and Sunbirds, but the Bearded Sugarbushes form ideal hideaways. The also carry the Protea Itch Mite between flowerheads. Usually only one or two beetles occur in a flowerhead, but occassionally orgies of up to a dozen beetles may occur. They feed on pollen and nectar. If taken out of a flowerhead on a cold day, they require a few minutes to warm up (feel them vibrating - flying without using the wings) before they can fly. Have a look at pictures of pollinators on the newly (March, 2001) discovered Climax Conebush - 'Leucandendron climacticum'. Leaf Beetles are the 4th largest beetle family. Most of them feed on leaves or decaying plant parts and have larvae which feed on leaves. They include Tortoise and Golden Beetles, but perhaps the most famous is the larvae of the Arrow-poison Flea Beetle, which bushmen use to poison their arrows. The Protea Flea Beetle occurs in largest numbers in old Sugarbush flowerheads, where they eat the styles. They are easily recognized by their jumping when disturbed. Large numbers may occur in older flowerheads, especially of the Common Sugarbush. They are not as abundant in Bearded Sugarbushes, presumably because they cannot escape by jumping. The Cucujoidea is one of the most successful Beetle groups - one-third of all beetle families occur in the Cucujoidea, but most have only a very few species. One group that has done well in terms of species in southern Africa, are the Darkling or Tenebrionid Beetles, which includes the toktokkie. 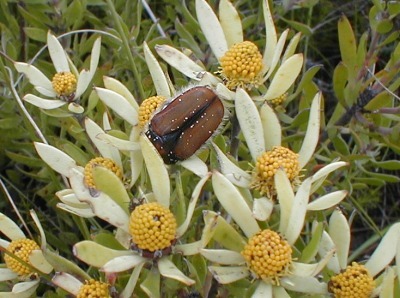 The Protea Rhizophagid Beetles includes the Bearded Protea Rhizophagid Beetle Phyconomus tricolor which and the Common Protea Rhizophagid Beetle Phyconomus sp. Both occur most commonly (about 6 beetles on average per flowerhead) in middle-aged Sugarbush flowerheads. They tend to be found between the involucral bracts as much as between the styles. They seem to feed on pollen, but this is not certain. Bugs differ from Beetles in having sucking mouthparts and the upper wing covers transparent in the lower half. The Minute Pirate Bugs are mainly predators on other insects and insect eggs. They are found in a variety of habitats, but most often are seen in flowers, hence the alternate common name for the group of Flower Bugs. 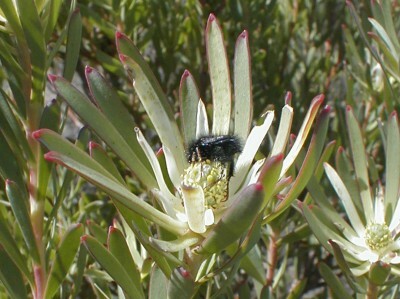 Xylochoris is present in Protea flowerheads at all stages. Numbers of bugs seen increases with flowerhead age, right up to the oldest flowerheads. They are found on Bearded and other Sugarbushes. Protea Itch Mites live off pollen in sugarbush flowerheads. In the Bearded Sugarbushes they may flourish and amount to over 6000 mites per flowerhead. It is not known if they play a role in pollination. They hitch lifts (technically known as "phoresy") in large numbers of Sugarbirds, Sunbirds and Green Protea Beetles, and in smaller numbers on the smaller beetles. When the visitor lands on the flowerhead huge quantities of mites stream up to their heads and feet, and lodge between the feathers and hairs. They may perhaps tell pollinators which flowerheads have not been visited recently when they get anxious for a lift and mull about the top of the flowerheads. They are called Itch Mites for obvious reasons - they itch. To people who smell Sugarbushes (a silly thing to do, because bird-pollinated blossoms do not have scent) they should be called Sneeze Mites.